-THE "BOTTOM"/"BOTTOM" 48 INCH STRAP CONFIGURATION IS PERFECT FOR SECURING TO UNDERSIDE OF BACK SEAT IN TRUCK. This is a simple but great idea. Bought 3, kept two and gave 1 to a good friend. Instantly turned my truck tactical, but I got to choose how because I got to build Molle to my needs rather than pre-config. Scabbard for a 590 shockwave, Med kit, admin pouch, pistol holster, mag holders in multiple sizes. If I want to re-config for a trip...easy to do. Describe your general use for the product? 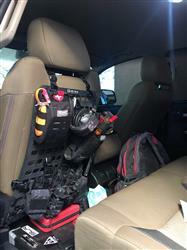 Having a handy spot for an ifak,tool kit for the truck and a chest rig that is easily accessible. Does the product feel sturdy/durable? It does. I did attach everything outside and it was warm here. 90 degrees or so. Seems to become more pliable in the heat. As soon as I put it in the truck became more rigid. I'm not concerned with heat, windows on the tundra are %5. With tool bag and chest rig. The product feels solid. I used some electrical tape on the glides to keep the webbing from slipping. What MOLLE brand gear have you successfully mounted? I have two Ifaks from Vanquest gear. 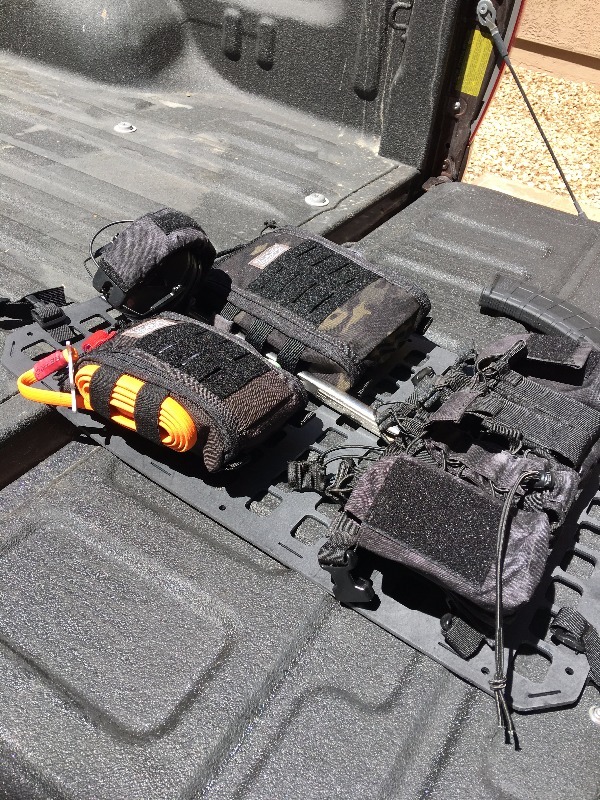 Their med size pouch and lrg size pouch for my tools used some 6" molle straps from condor to mount. I also used some 1" buckle and strap to mount a haley strategic d3cr. Oh and a carabiner to hold my Peltor ear pro. 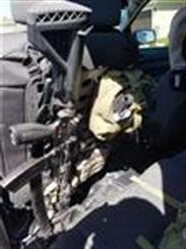 What type/model Vehicle, Backpack, Pelican Case etc. have you mounted our panels to? I'm using this in a 2016 Tundra CrewMax 6 seater. Are you happy with your purchase? Extremely happy. Been searching for a while for an item like this, these are awesome products! Buy it now!!! 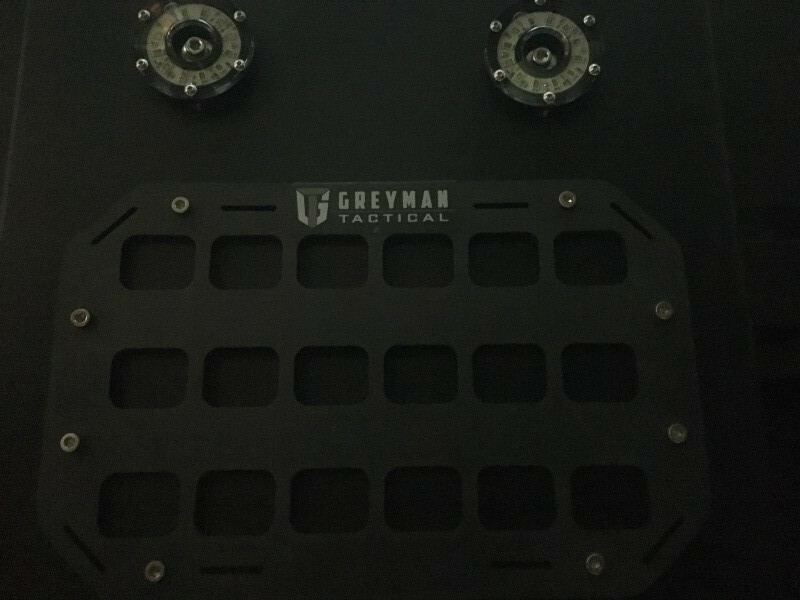 grey man tactical molly for my truck. I am a firearms instuctor for my local police department. I needed something to keep my gear neat, organized and hidden. I was searching the web one day and found the grey man tactical website. I ordered the molle and all the straps for my pickups rear seat. When I received the product it was very well made. Everything fit perfect. 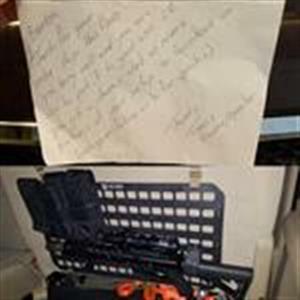 I'm able to mount two ar-15's, med lot and my magazines 29th no problem Love this product and will be buying more.